Having only ever been a ride leader for ladies rides, I decided to step into the unknown and lead a novice ride. I was a bit worried to say the least as I’m not the quickest rider (especially up hill). 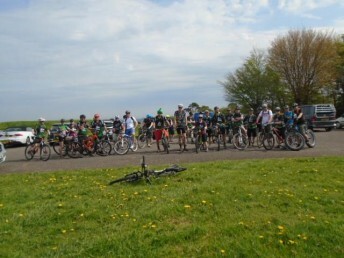 Glorious sunshine met me at Barbury Castle and by 10am, 28 riders – gulp! 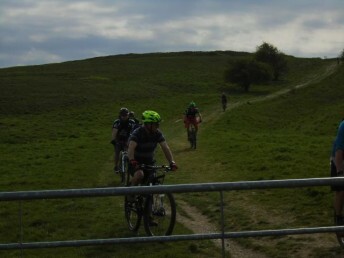 There were riders who had ridden to the start, riders who had driven from Malvern, Worcester and Stratford and a couple of riders on their first MBSwindon ride. There was also a variety of bikes – hard tails, full susses, a fat bike and a cx bike. Paul Allum kindly agreed to be back marker and due to the size of the group, Debbie Davies also kindly agreed to be a floating rider. 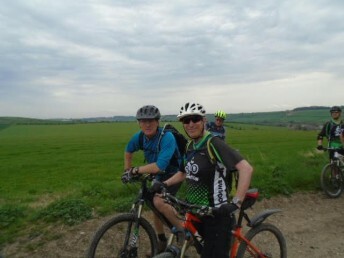 So after the obligatory start of ride photo, we headed off across Barbury Castle and down the steep side and to my relief, all still in one piece. We then headed along the old Ridgeway to the Chiseldon-Marlborough old railway line when there was a brief wait whilst a puncture and a mechanical issue were attended to. We then carried on to the Radio Mast climb which is a bit of a challenge. At this point I must pay special tribute to possibly the oldest member of the club, Tony Holmes, who at a spritely age of nearly 72, made it up the climb in one go (certainly puts me to shame). After re-grouping at the top, we carried on to the next (two-part) descent and judging by their faces, I think everyone enjoyed it. 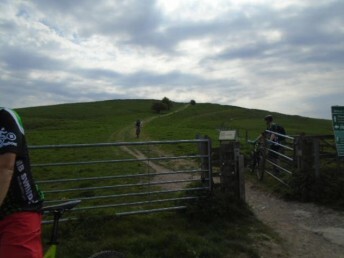 Then the climb back up to 4 Mile Clump – luckily with a refreshing breeze. 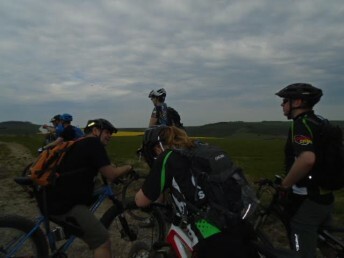 Whilst part of the group remained to fix another puncture, Chris Hopkinson carried on back up to Barbury Castle with part of the group. 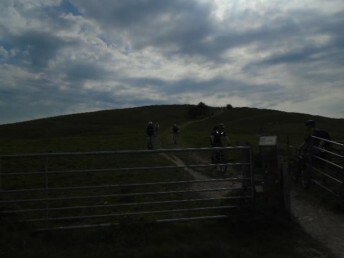 Puncture fixed, the remainder of the group then carried on up 4 Mile Clump. Back at Barbury, the cakes had already been started but, luckily, there was plenty for everyone! (Thank you to Debbie for baking). Big thanks to everyone who attended and made this ride so enjoyable (and quickly helped ease my nerves lol).